Australia and cricket are like blood and blood vessel, you cannot even think of separating them! For a country which has dominated cricket since it's inception, it would be a hard pill to swallow if someone said they don't know how to play their beloved game. But has that level of play remained the same? Or we are witnessing the downfall of a great cricketing nation? The year has been a period of depression for cricket Australia and for cricket too to some point. It all started with, now known infamous 'sandpaper gate' which literally tore apart the Aussie cricketing spirit, which they boasted of for so long and as a matter of fact not only took pride but also took some moral high grounds too, many would remember the infamous Sydney Test in 2008 against India. But, it didn't fetch too far into every Aussie household as it did this time with horrid images of crying Smith, Warner and Bancroft pleading guilty on their television sets. For me, they deserved it; and being an Indian it seemed like some kind of revenge for that 2008 Test. Without captain and vice-captain what followed was just disgusting performances with losing the fourth Test against the backdrop of the third Test where it all happened and then getting hammered 5-0 in ODIs against their arch-rivals convinced ever proud Aussies fans that their team ain't gonna be the same ever after this. The team headed to Asia, their nemesis over the years to play against Pakistan who were just out of a shameful Asia Cup. This was going to be one of those contests where both teams didn't look good on paper either, no wonder why people didn't turn out for the match. But, Pakistan was gonna have that edge over any non-asian team playing in their home turf, and almost looked like the Aussie were gonna be rattled soon in the first Test with debutant Bilal Asif picking up a five-fer and Abbas showcasing his skills. 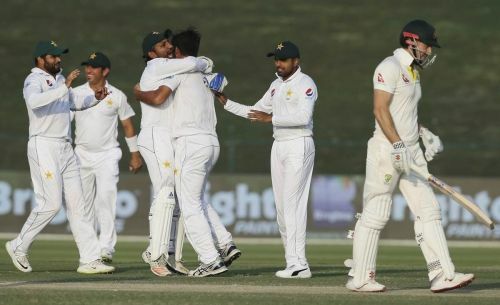 Pakistani batsmen played well too and with injury-plagued Starc and other bowlers struggling it was Lyon who did pretty well to constrain the target. But against all odds, there was a revival of Aussies spirit and after 139.5 overs of gruesome batting in that scorching heat, it was something sensational that they could pull something of draws like this and that too in this manner, with Usman Khawaja playing innings of his life and Tim Paine playing like a true Aussie skipper. It truly was a remarkable moral victory for Aussies. They were now as confident as they could have never imagined. But as the saying goes, "what goes around comes around." It was much too early for cricket pundits to proclaim, that this is it! The Aussies are back! But as they say "every killer has his own modus operandi" Mohammed Abbas's was a silent one and stunned everyone and shut down those who undermined Pakistanis. For a team which never accepts defeat, losing to a team like Pakistan by 373 runs is a humiliation of highest order. This surely has set alarm bells ringing in the Aussie camp and has put a question mark on the Aussie domestic circuit as well. For it surely has sent their team in a state of desolation and put a big question mark on their bench strength. Where does this leave cricket down under?